Venue: Russell Lea Public School, Russell Lea, Sydney, NSW 2046, Australia. Venue: Concert Hal 'Centar za Kulturu Bijeljina', City of Bijeljina, Bosnia and Herzegovina. In the past 20 years in the Netherlands and the rest of Europe Hrustanbegovic gave more than 1,000 performances: including seven times in the Concertgebouw Amsterdam (3 times a solo concert), in the La Cathedrale Notre Dame Le Puy en Valley (national monument of France, Pilgrimage Route Santiago de Compostela and since 1998 part of UNESCO World Heritage Site), with Grace Jones in Paradiso Amsterdam, with Flairck in Royal Theatre Carré in Amsterdam, Hall of Knights in the Hague, Vredenburg Utrecht in presence of Her Majesty Queen Beatrix, with Al Di Meola in Metropol and during the opening of Sarajevo Film Festival. 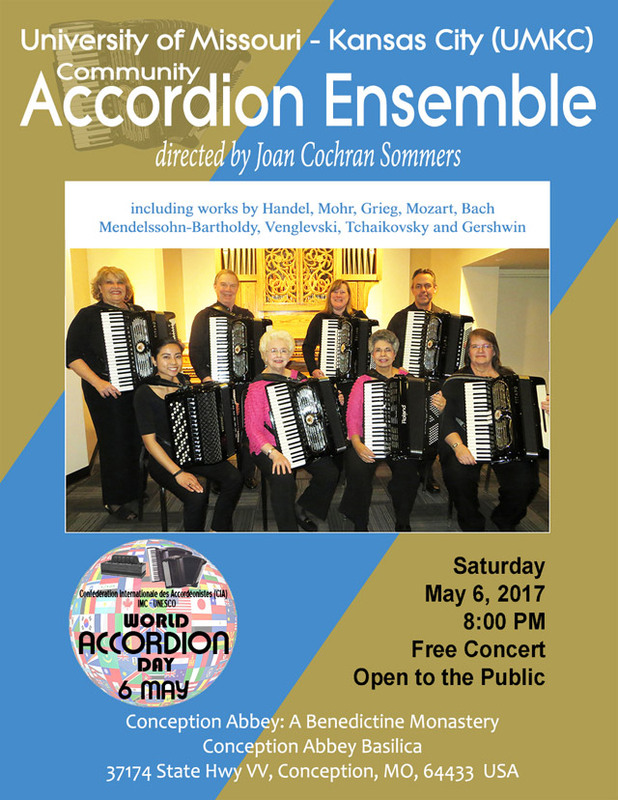 As the first accordionist in the world to interpret, play and record the entire Four Seasons of Antonio Vivaldi, based on the urtext original music score, on the concert accordion, this concert program has a historical and musical basis. Video above: Rhapsody for Johanna, composed and performed by Nihad Hrustanbegovic, recorded live in concert, 4th May 2017. The work features variations on the Macedonian love song Jovano, Jovanke, a Macedonian traditional folk song. Venue: Cottage Bistro, 4470 Main Street, Vancouver, BC V5V 3R2, Canada. Venue: The George Traditional House, #101­31 Southridge Dr Okotoks, AB, Canada. 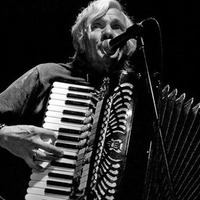 More Info: Howard Schmenge Chapman playing Accordion with the Brother Ray Lemelin Blues Band www.schmenge-accordion.com. 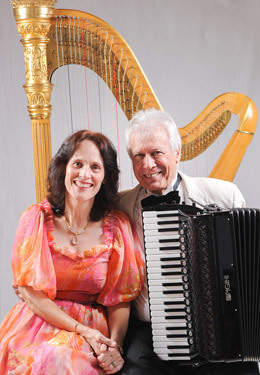 More Info: The Disccordiannas are an enthusiastic amateur accordion duo from Regina, Saskatchewan. They will be playing a few tunes in front of Malty National on 15th Avenue. 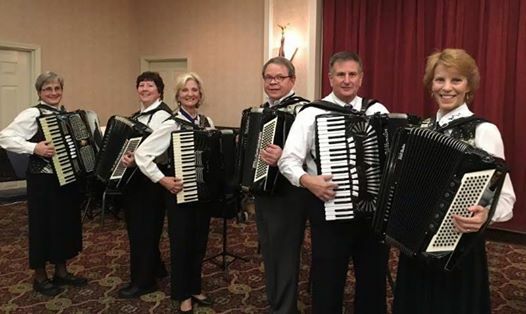 Dust off your accordion and join them this lovely Saturday afternoon! 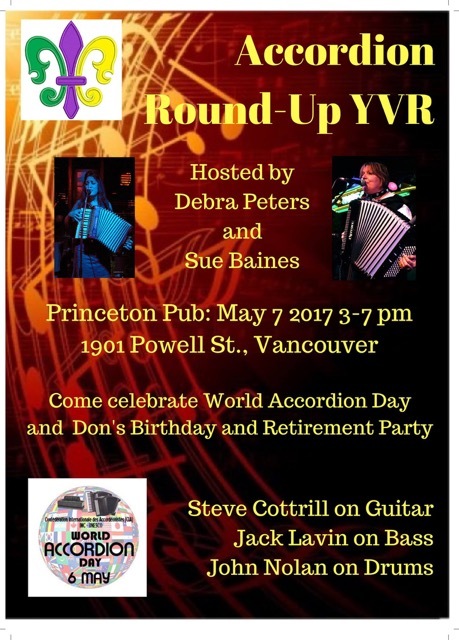 What better way to celebrate World Accordion Day? Venue: Jockey Club Creative Arts Centre, Jockey Club Creative Arts Centre, 30 Pak Tin St, Shek Kip Mei, Hong Kong. 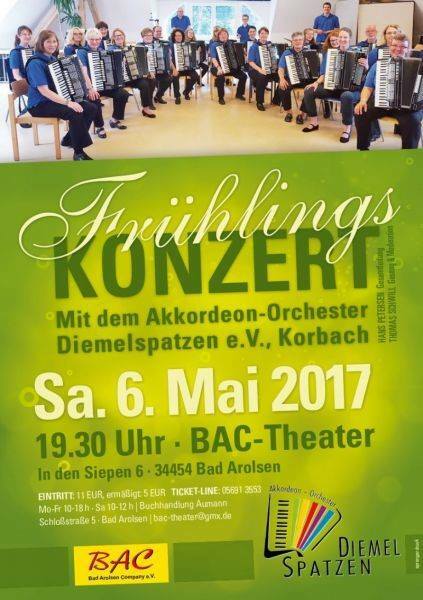 Venue: The Akkordeon-Orchester Diemelspatzen e.V., Korbach (MD Hans C. Peterson) perform in concert at the BAC Theater, In den Siepen 6, 34454 Bad Arolsen, northern Hesse, Germany. Concert by Budapest Liszt Ferenc Academy of Music, students of the Accordion Department. Accordion students concert and open day. Video of a patriotic song from the film Jagriti (1954) is played on accordion by Brij Narain Mathur in celebration of World Accordion Day. Venue: Beit Yona House of the elderly (hostel) in Beer Sheva. 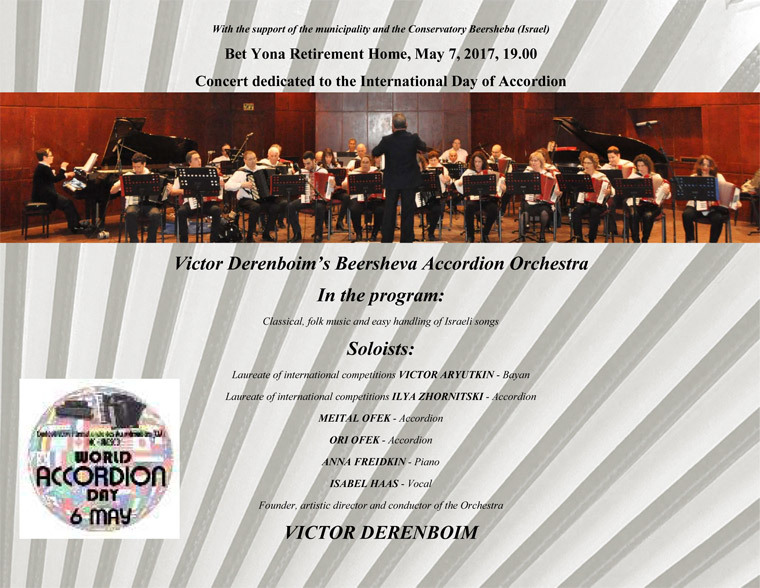 Charity Concert celebrating World Accordion Day with the accordion orchestra of Victor Derenboim in the Beit Yona House of the elderly (hostel) in Beer Sheva on May 7th. Performances of the orchestra in this venue are becoming traditional and this year we give a charity concert there for the third year in a row. The performers are listed on the poster below. 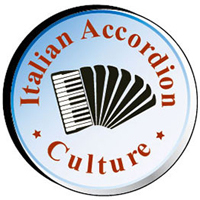 Organiser: Italian Accordion Culture (IAC), Italian member of the Confédération Internationale des Accordéonistes (CIA). Venue: Castelfidardo San Francesco Auditorium. 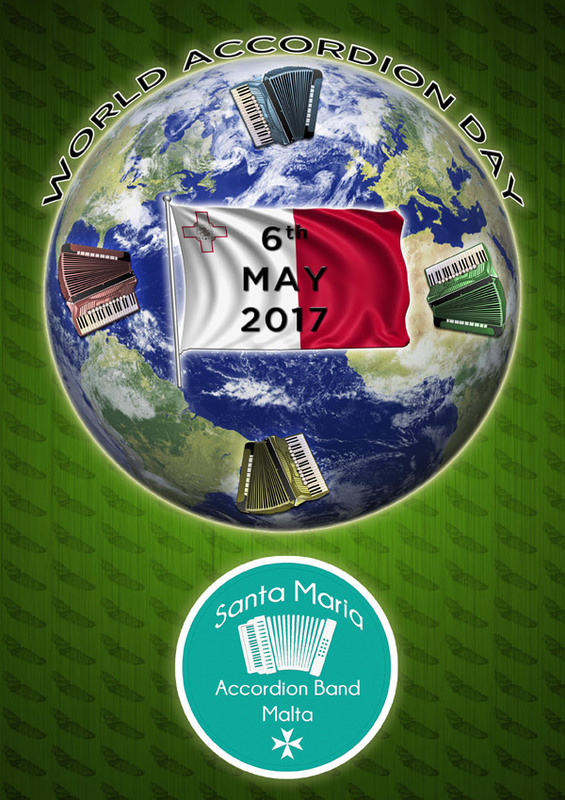 Italian Accordion Culture (IAC) and the support of the City of Castelfidardo are organising on May 6th their qualifications for Italian accordionists to compete in the 2017 Coupe Mondiale, being held in Italy, 5th - 10th September 2017. Qualifications of soloists, concert music categories, entertainment music categories and ensemble music categories. The Auditorium San Francesco in Castelfidardo will host, from 9:30 am to 6:30 pm (public invited, free entry), the selection of Italian accordionists for the Coupe Mondiale. There will be 19 soloists and three groups. 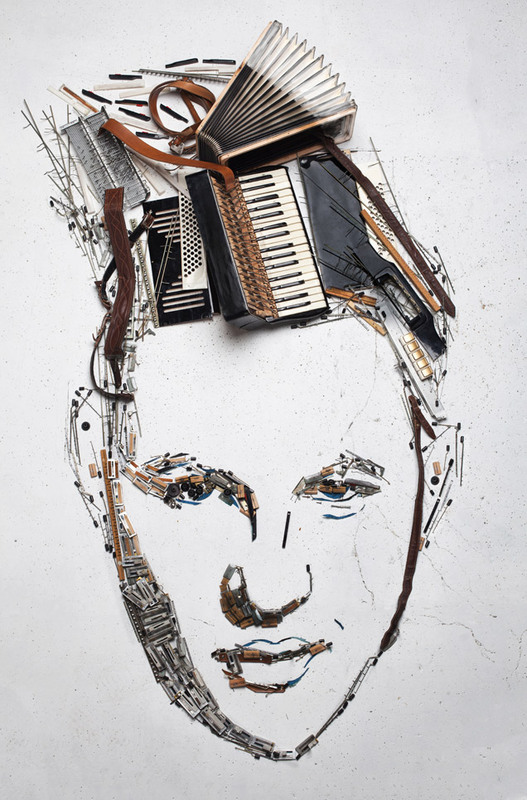 - A. Schnittke "Gogol Suite": "Overture", "Official", "Waltz", "Polka"
This continues Martynas' idea last year when he commissioned a portrait made from recycled accordions (picture below). For 2017, the new merchandise will be accessories made from accordion parts taken from old but no longer playable instruments, transforming the recycled instruments into something new. It is an innovative and contemporary way to show some of the many parts that make up an accordion and a stylish tribute for World Accordion Day! Date: May 6, 2017, Time to be announced. 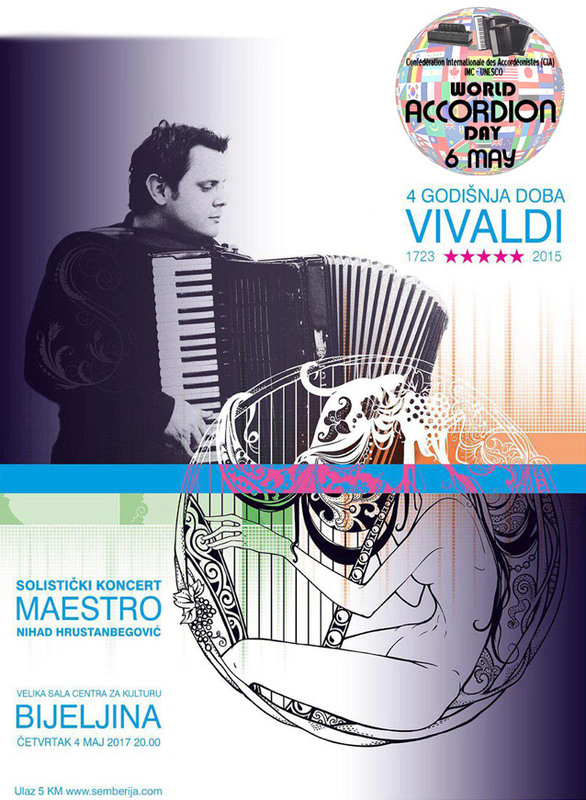 The Macedonian Association of Accordionists “Ljubiteli na klasicna muzika” Skopje is delighted to invite you to the World Accordion Day Gala Concert which will be held at Macedonian National Theatre Skopje on May 6th. The concert will feature renowned artists from Macedonia and accordion students from the class of Prof. Zorica Karakutovska performing works by Mozart, Derbenko, Bete Ilin, Semjonov, Piazzolla and others. A special guest on the concert will be Grayson Masefield from New Zealand who will perform the composition "The New Tomorrow" by Bete Ilin which was premiered this March in Lausanne, Switzerland. 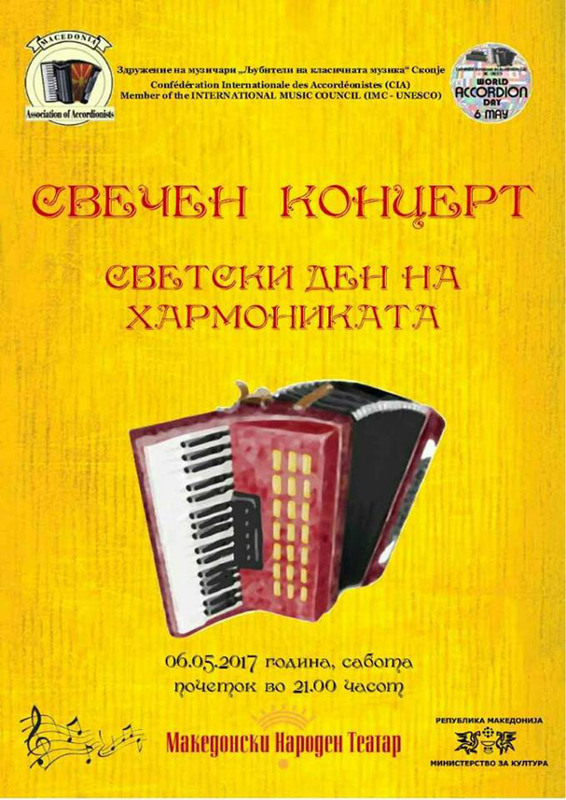 The international project "May 6th World Accordion Day" is supported by the Macedonian Association of Accordionists with various events and successful realization of concerts at home and abroad. 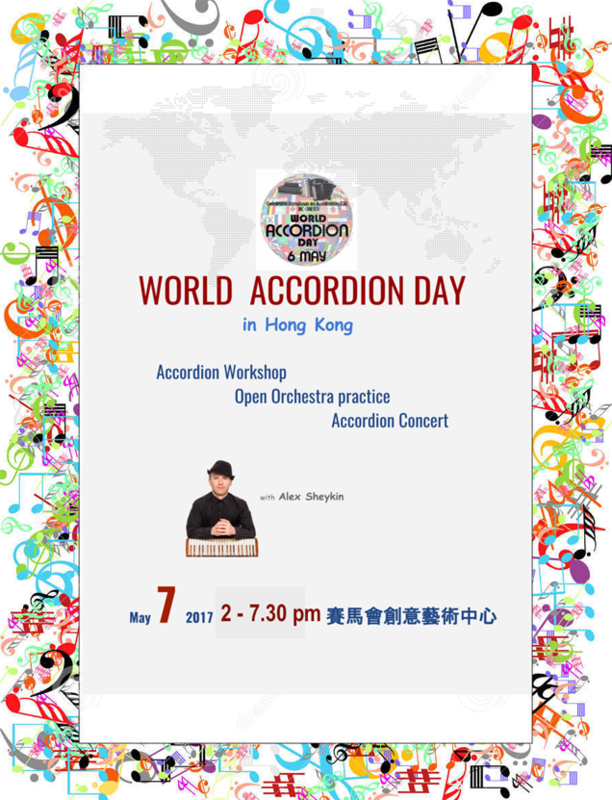 This year, for the ninth time, the association organizes a solemn concert marking the celebration of the International holiday and birthday of the instrument accordion. The project is supported by the national program of the Ministry of Culture, Republic of Macedonia. 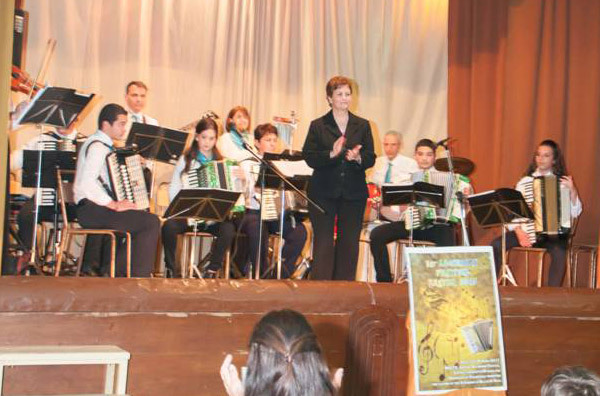 An article with the information about the ninth World Accordion Day, being held on the 188th birthday of the accordion, is published in all main newspapers and portals in Macedonia. During this week, President of MAA, Professor Zorica Karakutovska, is promoting the event appearing live on the National TV programs. Stay tuned for the upcoming report of these activities to be listed here, shortly after the concert. Date: May 6, 2017 at 16:30 hours. 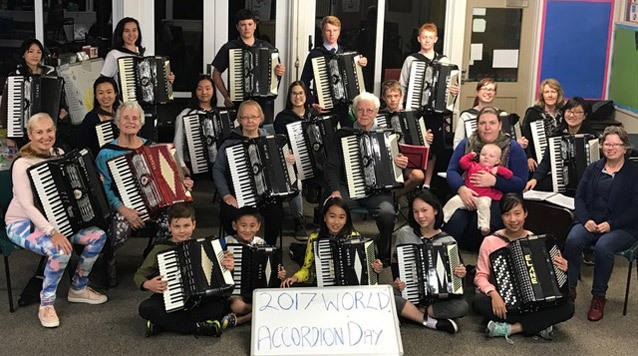 New Zealander Annie Gong is performing two World Accordion Day concerts in the USA. The details are listed under USA events. North Shore Accordion Orchestra rehearsal and group photo for World Accordion Day. In program: Bela Bartók, César Franck, Vagn Holmboe, Wolfgang Jacobi, Dominik Karski, Astor Piazzolla, Alexander Puszkarenko, Albin Repnikow, Wiaczeslaw Siemionow. 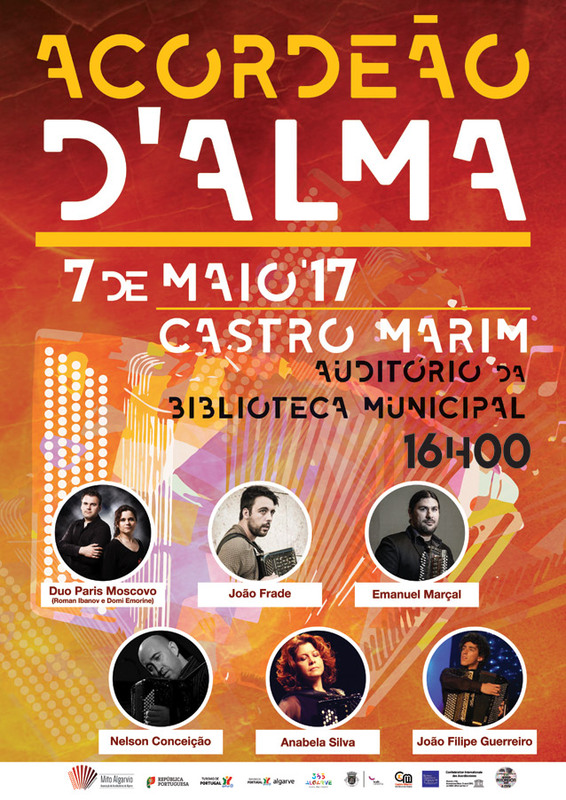 Dates: May 6th at 9:30 p.m.
May 7th at 4:00 p.m.
Accordion d Alma - Soul Accordion is a concert that tries to portray a unique history, the soul of an accordion that the Algarve brings to the chest. 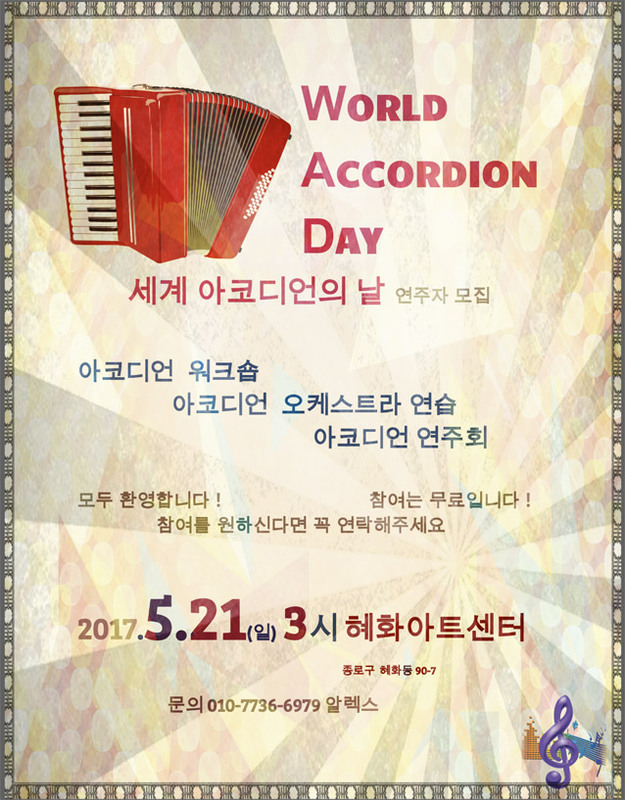 It is part of the celebrations of the World Day of the Accordion, celebrated all over the world during the month of May (6 of May of 1829, when the accordion patent was presented). On the stage there will be a panel in a discussion format, composed of five speakers, moderated by a journalist, where a historical structure of the instrument will be made, as well as an approach on the unique and differentiating soul existing in the Algarve around O Accordion. The moments of discussion will be interspersed by musical moments by renowned world accordionists: Joao Frade, Nelson Conceicao, Joao Filipe Guerreiro and Duo Paris Moscou (composed by the world champions Domi Emorine and Roman Jbanov), Emanuel Marcal and Anabela Silva. During his performances he will be accompanied by a visual artist, who through digital drawing done in real time, will capture and reinvent the essence of each song and dialogue with the performer, also giving a more interdisciplinary and contemporary tonality to the presented contents. 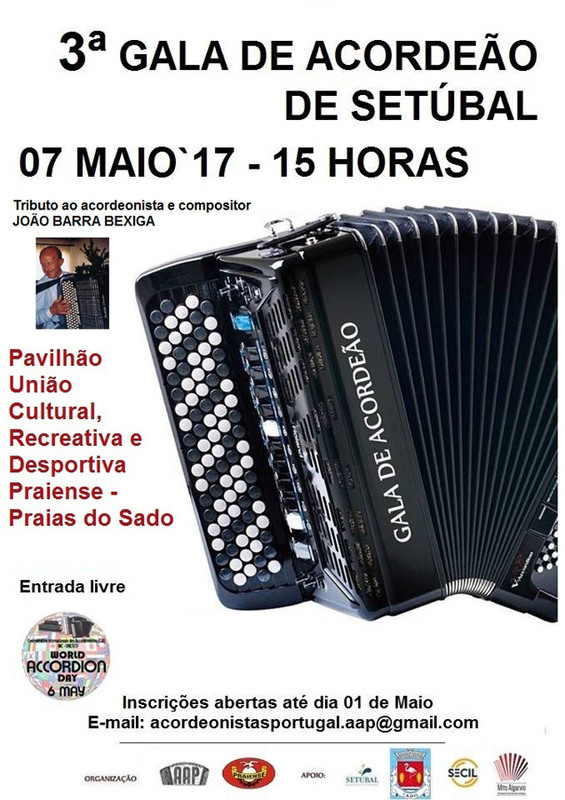 Accordion d'Alma - Soul Accordion is a project of the Algarve Myth - Accordionists Association of Algarve, supported by the 365 Algarve program and by the Municipalities of Loule and Castro Marim. 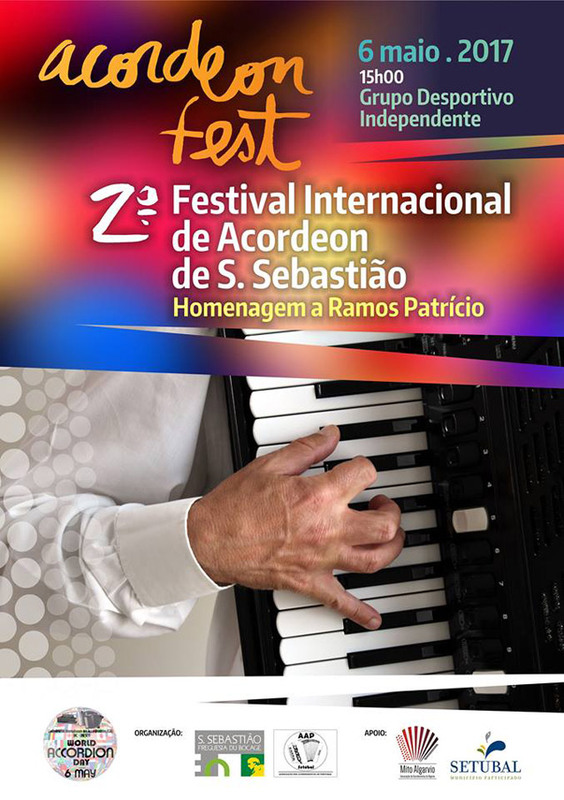 Festival Organized by AAP - Setúbal, Freguesia of S. Sebastião and Supported by the Mito Algarvio and Municipality of Setúbal. Festival Organized by AAP - Setúbal and Praiense; Supported by the Mito Algarvio and Municipality of Setubal. Friedrich Lips performing a world premiere: Michael Bronner: "Eight sonnets about love" for bayan and chamber orchestra. Date: Because May 6th clashes with May Day celebrations in Russia, they have All Russian Day of Bayan, Accordion and Harmonica on the third Saturday in March, which in 2017 is March 18th. Video: Friedrich Lips performing a world premiere of the Michael Bronner composition "Eight Sonnets About Love" for bayan and chamber orchestra. The sound of Accordion has lost in a bustling City like Singapore. Lets's celebrate the 188th birthday of the accordion - May 6th 1829, the date the accordion was first patented, in Vienna, Austria, by Cyrillius Demien. 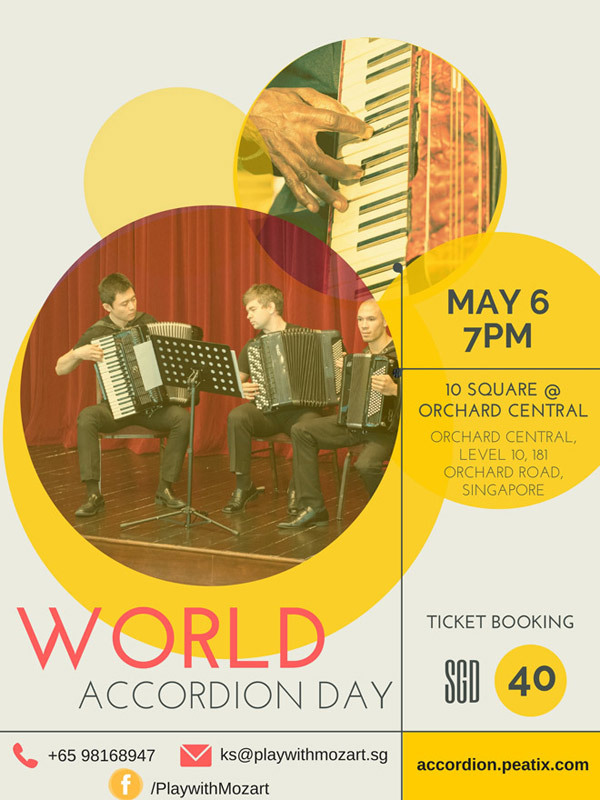 Accordion Singapore Ensemble will present the best popular and classical accordion music. Tickets are on sale via http://accordion.peatix.com Sasha Farseev is one of the known musicians in his home city of Saint - Petersburg. He started his music studies at the age of six when he entered the Saint - Petersburg Music School N4 (class of S. Uhno). He performed hundreds of concerts in different Russian and international concert venues. Most notable performances were conducted in: "Saint - Petersburg Big Concert Hall, 2007", "Saint - Petersburg Capella Concert Hall, 2009, 2010", "Saint - Petersburg Philharmonic Hall, 2013", "Mosaic Festival 2014 @ Esplanade, Singapore", "Singapore National Libraries, 2014, 2015", and Singapore Art Museum, 2016. The most prominent awards are the 1st and the 2nd prize in international accordion music festivals "Baltica Harmonica, 2000, 2002" and the 3rd prize in international music festival "Peter and Paul Asamblea, 2005". During the recent years, Sasha was working with the accordionist ensemble "Primavera" that was officially introduced in 2012 (Saint - Petersburg). 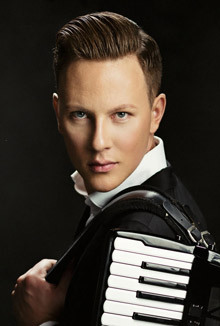 In 2012 he was appointed as a resident accordionist and the accordionist ensemble conductor in Saint - Petersburg Rimsky - Korsakov music school. He is the co-founder and leader of the "Accordions Singapore" accordionists community and "Accordion Singapore Ensemble". Jiaxi Zhang is one of the young accordionists from city of Xi'an. He began his accordion journey at the age of five when he enrolled in the accordions group of the Children's Palace of his city. Soon after that he continued his accordion study in Xi'an Conservatory of Music, supervised by A. Professor Liu Yongyuan, who serves as the Executive Director of Chinese Musicians' Association - Accordions Council. Jiaxi's accordion playlist ranges from Chinese to Western, and he has vast accordion performance experience in music festivals and concerts, including Xi'an Conservatory of Music Accordion Performance, 2004, Tsing Hua University Music Camp, 2006 National University of Singapore - University Culture Center, Orchestra Performance 2009 & Jazz Music Festival, 2010, Singapore National Libraries, 2016, and Singapore Art Museum, 2016. He was the 1st prize winner of China National High School Student Art Winter Camp and the only representative from north - western China. 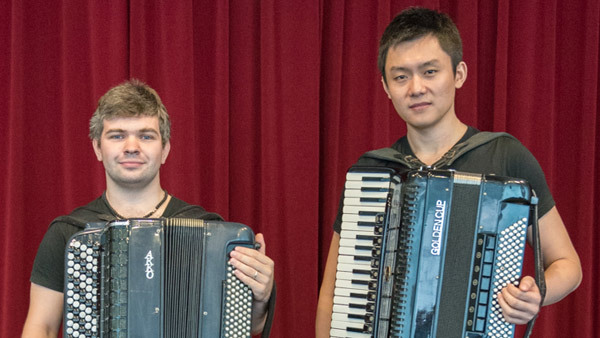 In recent years, Jiaxi devoted himself in cultivating Singapore local accordion culture through co-founding the Accordions Singapore community and Accordion Singapore Ensemble. 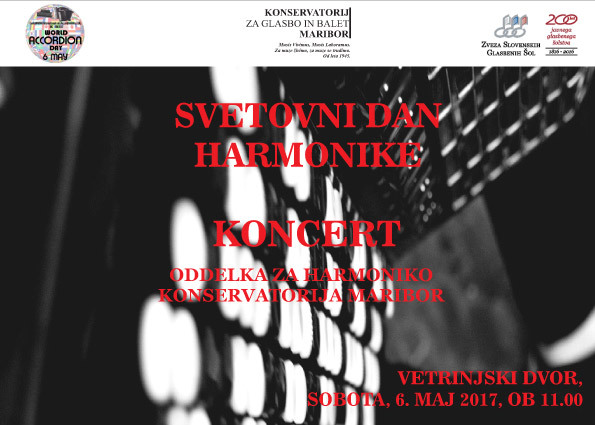 Concert of Students, soloist, chamber groups and orchestra organised by The Maribor Conservatory of Music and Ballet, Slovenia. Venue: Vetrinski dvor, Maribor, Slovenia. 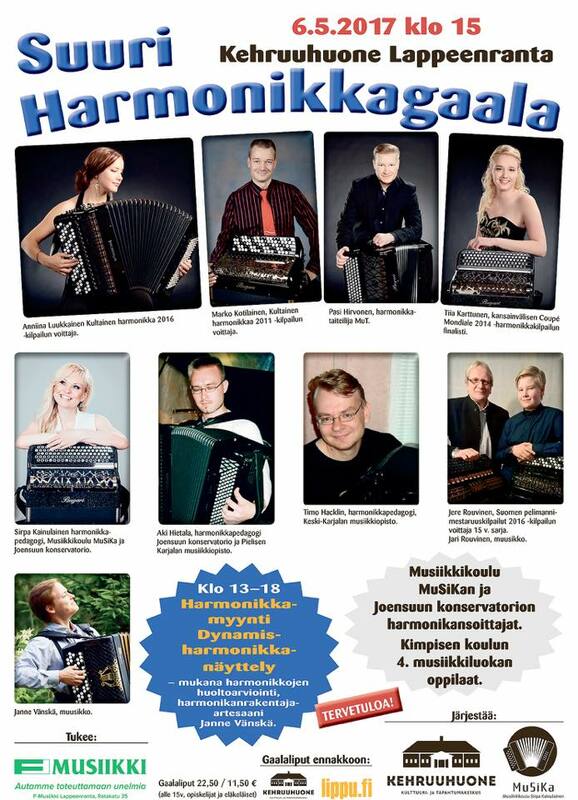 Concert and Launch of Accordion Syllabus. 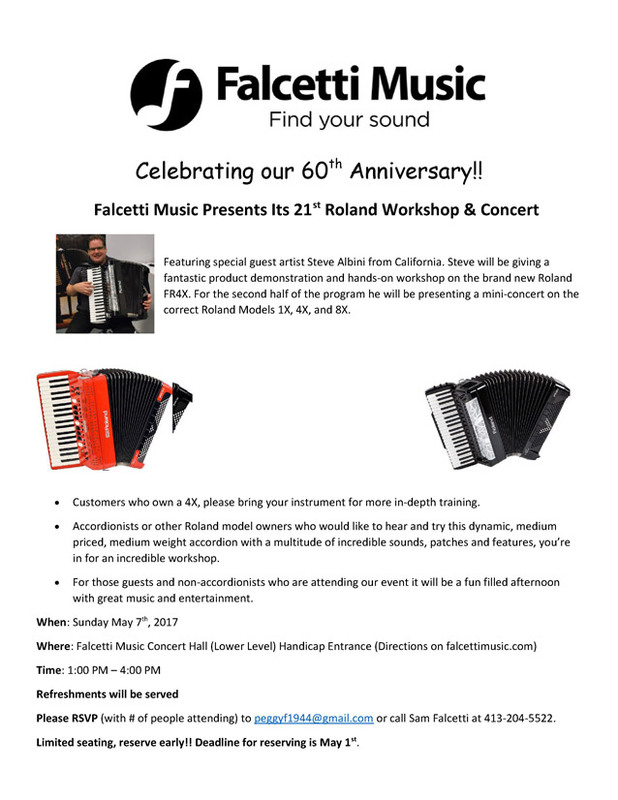 Concert for young accordion students and seniors. Date: 6 May 2017 at 18:00 hours, Entrance FREE. Also taking into the celebration, the launch of the Accordion Syllabus for the LCM (London College of Music Examinations) University of London. The syllabus are released world wide by the LCM. Pictured is Sergio Zampolli and his wife Amarillie. Venue: Auditorio Municipal, San Vicente del Raspeig, Alicante, Spain. 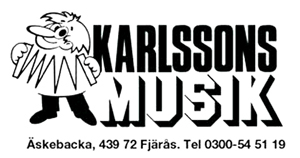 You are invited to Karlssons Musik on World Accordion Day (WAD) Saturday May 6th! We will celebrate WAD 2017 with an ”open house” here at Karlssons Musik with artist performances by Hanzhi Wang (China) and Lisa Eriksson Långbacka (Sweden), instrument demonstrations and we also serve coffee and cookies. Hanzhi Wang is truly a world artist who has won several international competitions, concerts in many countries and now for the first time in a little place called Fjärås! Lisa Eriksson Långbacka was voted “Accordionist of the Year” in Sweden 2014 by the members of SDR – Swedish Accordionists Association. She plays very a delicate and poetical style with roots in folk music. This year we also have a Pigini theme on WAD and we proudly announce that a representative from the Pigini factory in Italy will be here in our shop on WAD. Visitors will also have the opportunity to visit our unique accordion museum (picture below), now with over 300 accordion instruments from all over the world, the oldest ones from around the 1850's and we will also present some nice offers on instruments, accessories, books and CD's. 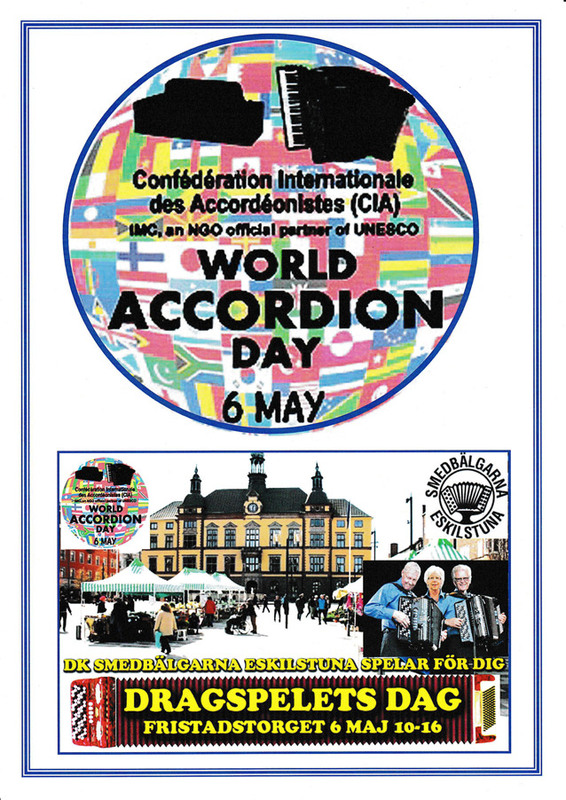 Enjoy a very nice WAD Saturday May 6th for accordionists here in the west coast of Sweden! 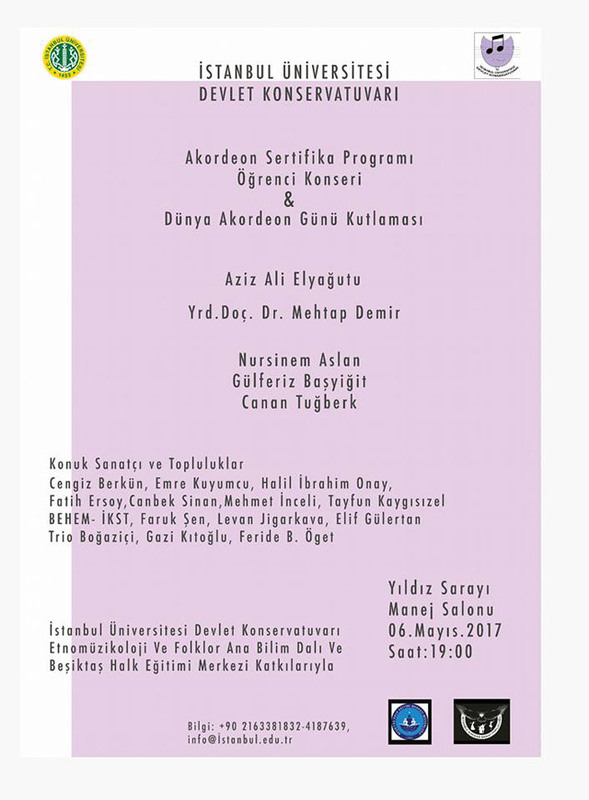 Venue: Istanbul University, Devlet Konservaturvari. Information on poster. Date: May 6, 2017, 8 pm. 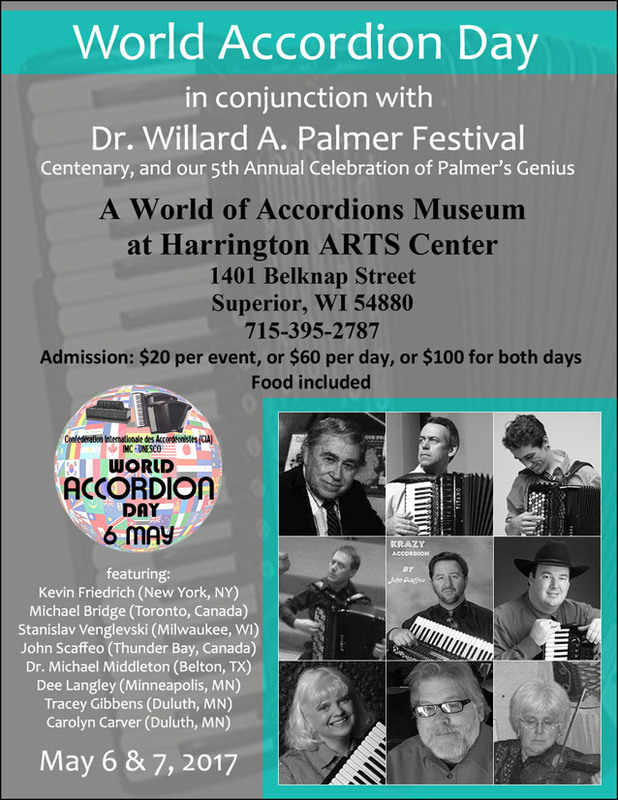 World Accordion Day In conjunction with Dr. Willard A. Palmer and our Fifth Annual celebration of this great American educator and artist. May 6-7, 2017 - At AWAM’s Strahl Concert Hall - All day. 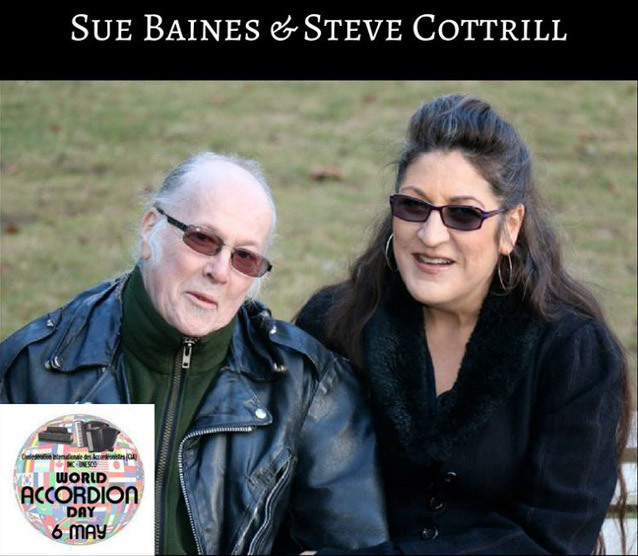 World Accordion Round­Up, Austin Texas by Debra Peters & The Love Saints Band. Venue: Broken Spoke, 3201 S. Lamar Blvd Austin, TX 78704. 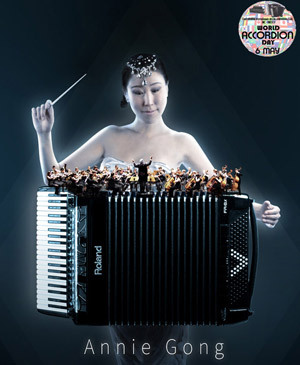 World Accordion Day Concerts by “Annie Gong & Her Magic Orchestra”. Date: As on the poster below. Annie Gong is a highly accomplished digital accordionist & professional entertainer who has a very busy schedule playing on several Cruise lines as a headline Artist. Originally from China, now based in New Zealand and performing worldwide. Annie plays a Roland digital accordion and her unique 2 by 45 minute shows & performance, receive many standing ovations & lots of great audience feedback. 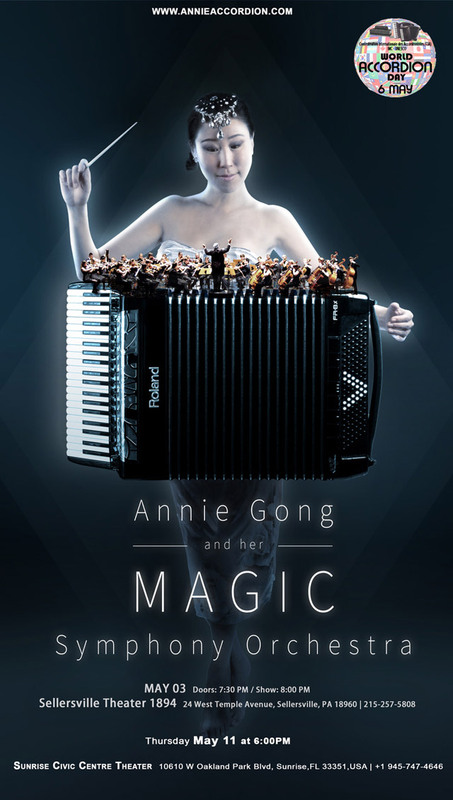 “Annie Gong & Her Magic Orchestra” includes music from classical, romantic, movie, pop and rock music. Venue: Stubb’s Waller Creek Amphitheater 801 Red River St Austin TX 78701. 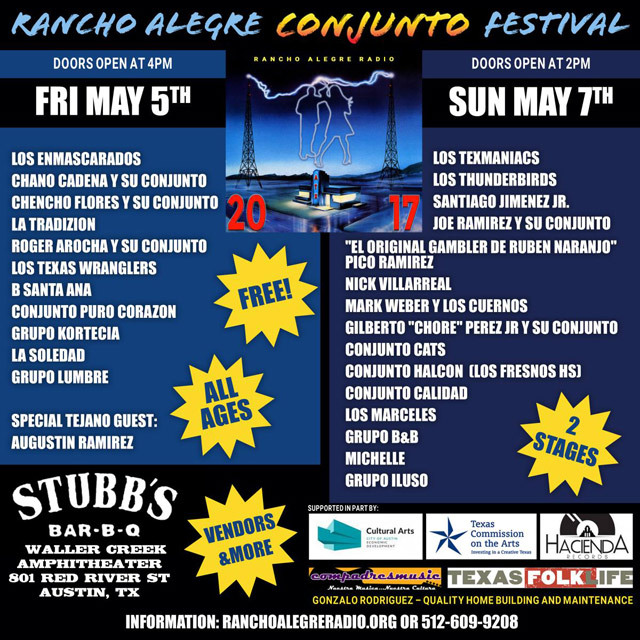 The Rancho Alegre Conjunto Festival is BACK! This year, we will be at the legendary Stubb's Waller Creek Amphitheater on May 5th and 7th! 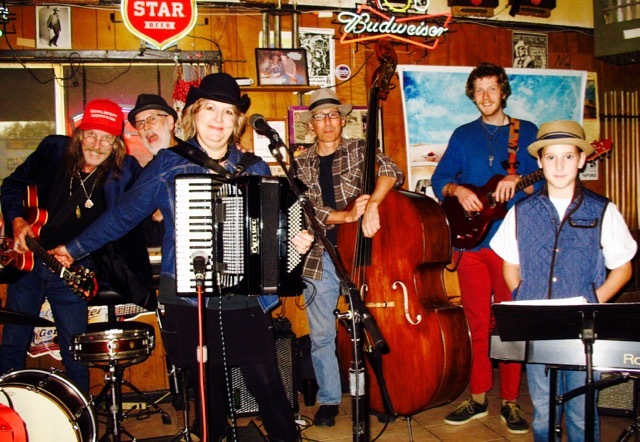 The Rancho Alegre Conjunto Festival burst on to the Austin music scene in 2012 with a fresh take on Conjuno, which is a traditional, accordion­driven Texas music form. Presented by Austin non­profit organization Rancho Alegre Radio, the festival hit the ground running with a lineup full of legendary, veteran and up­and­coming groups from all over Texas, much to the delight of music­loving fans who couldn t get enough of the bright accordion melodies and irresistible beat. In just three short years, the festival brought over 40 different groups, many of whom had never played in Austin, to the Live Music Capital of the World. In 2017, the Rancho Alegre Conjunto Festival has returned! And has found a new home at the world­famous iconic music venue, Stubb's Waller Creek Amphitheater! Join us at Stubb's over Cinco de Mayo weekend for two days and two stages full of accordions, bajo sextos, dancing, and down­home, traditional Texas music. World Accordion Day Concert by Mangelly Georgia Accordionaires directed by Christine Mangelly featuring Mom's favorites for Mother's Day. Venue: Augusta Museum of History 560 Reynolds St, Augusta, GA 30901. Crawfish Boil with Dan "Daddy Squeeze" Newton at Bistro LaRoux.